Autumn is here and the nights are drawing in, so it must be time for another Northolt Nightshoot. Once again the organisers appeared to have appeased the weather gods, resulting in a balmy dry evening to enjoy the rare and interesting aircraft on display. Phil Dawe and his team have a deserved reputation for attracting aircraft types rarely seen on these shores, as well as opportunities to shoot home based aircraft at night in an uncluttered and well-lit environment. Nightshoot XV continued that tradition. 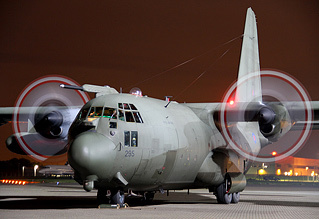 Nick Challoner was back at RAF Northolt for their fifteenth nightshoot. Photos from the UKAR Team and Harry Measures. The French provided the foreign participation, as they often do. 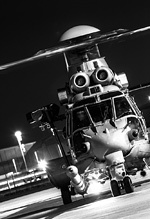 The French Air Force dispatched a combat search and rescue EC725 Caracal, a type rarely seen in the UK. 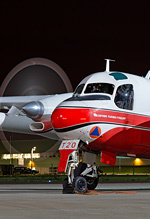 The Sécurité Civile once again provided a colourful Conair Turbo Firecat (a turboprop water bomber conversion of the S-2 Tracker), an even rarer sight in the UK, but not the first time one has appeared at a Northolt Nightshoot! Both aircraft ground ran during the evening, complete with various lighting configurations and the EC725 demonstrating its extendible refuelling probe. RAF support for the event was at either extreme of the size range, with a Grob Vigilant from the Central Gliding School, and a C-130K Hercules making possibly its last public appearance before the type's imminent retirement from RAF service. Again both aircraft ran, the C-130K making a particularly impressive spectacle with all four engines running at such close quarters. Sadly the aircraft concerned (XV295) was flown to St. Athan for disposal just five days after the event. QinetiQ supplied the Empire Test Pilot's School Avro RJ100 in its very attractive livery. The crew obligingly switched on various internal and external lights, including the tail floodlights to perfectly illuminate the gold ETPS logo. Also arriving and departing during the evening were the regular emergency service visitors: the London Air Ambulance MD902 and a Metropolitan Police EC145, which always add a splash of colour to proceedings and provide excellent opportunities to see and photograph their arrival and departure. 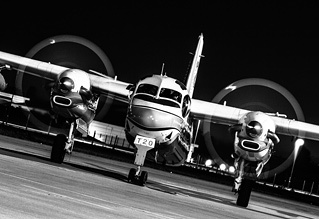 "We are fortunate at RAF Northolt to have the conditions which make for a unique photoshoot and I am grateful to the units from the UK Armed Services and our overseas friends who provide aircraft. I know that the photographers appreciate the efforts made by Station staff to support these events and all the work that is done by Phil Dawe and his team to get the aircraft to attend. The fact that the photoshoots provide a steady stream of funds to support the restoration of our WW2 Sector Ops building only serves to make the events even more important for us." As is quite often the case, there were some interesting ground vehicles on display too: a Panther protected patrol vehicle and a Land Rover RWMIK (Revised Weapons Mounted Installation Kit). These were kindly provided by 63 Squadron/Queen's Colour Squadron who are based at Northolt and kindly rushed back from a week on the ranges to be involved. As usual everyone appeared to thoroughly enjoy the evening, and it must be one of the best Northolt nightshoots yet. The engine runs were noticeably longer than at previous events, something that is very welcome indeed, allowing a greater proportion of those present to capture the action. Thanks must once again be extended to Phil, Lee and the team on another excellent event, and to the Station Commander and OC32 for allowing their airfield and pan to be invaded by a bunch of enthusiasts. As ever, all donations go towards the restoration of the historic sector ops building at Northolt, effectively the prototype for the sector ops rooms that played such an important role in the Battle of Britain.